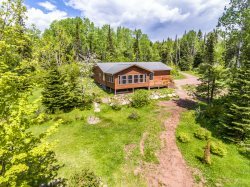 Caledonia Cottage and Tiny Home is an inland wilderness retreat in Grand Marais, MN. Lutsen Mountain is the largest ski area in the Midwest. There are 87 ski runs on four sprawling mountains. There are endless activities to enjoy and an exceptional collection of lodging to choose from. The spectacular, beautiful setting has hardly changed since C.A.A. Nelson landed here over a century ago. During the ski season, Papa Charlie`s hosts an eclectic mix of nationally known musicians. Past guests have included Richard Thompson, Little Feat, and Keller Williams, as well as regional favorites like Trampled by Turtles and Charlie Parr. Lower-key acoustic music is found on weeknights, as well as open mike nights, poker nights, comedy nights and other fun activities. Cook County boasts over 400 km of professionally groomed cross country ski trails and is one of the largest systems in the country. Trails are groomed for classic-style skiing or skate ski style. They also vary accommodating skill level. Easy, beginner loops are typically short in length and with few hills. Intermediate trails are longer and have a more hilly terrain. More challenging trails are usually longer with steeper hills and sharper turns, suitable for the more practiced, adventurous athlete. The terrain can be picturesque Maple Hillsides with views of Lake Superior, along river valleys and ridges or deep wilderness trails in the Boundary Waters. A Minnesota Ski Pass is required for most trails and available at service stations and some outfitters. Snowshoeing is a great sport and wonderful opportunity to explore the Superior Hiking Trail in the winter (www.shta.org). For the most part, snowshoeing can be done almost anywhere. Most of the cross country ski areas have snowshoe trails near by, just make note that there are trails designated for skiing only. Several area outfitters offer snowshoes for rent, give us a call for more information. Many area shops and galleries stay open during the winter. Compared to the bustle of summer, it is a perfect time to browse at a slower pace. Several top-notch restaurants stay open in the winter, especially on holiday weekends. All of which know how to serve up comforting, cold-weather fare. The website below has a comprehensive listing of winter shopping/dining options in Grand Marais and county-wide. A local favorite, river skiing is considered by some to be ultimate North Shore winter activity. Some of the rivers leading from the forest into Lake Superior are ski-able. It`s a great rush skiing (or sometimes jumping or rappelling) down frozen waterfalls and through deep gorges. However, we`re not going to tell you here which rivers those are, because it can be dangerous and you MUST have an experienced river skiing guide with you. If you are a fit, experienced skier and want to give it a try, call us for more information. Our local tourism organizations have made a huge effort in recent years to provide plenty of entertainment during the winter season. It sure has paid off. Every day there is something to choose from: acoustic music, naturalist programs, comedy performances, classical music, sleigh rides, dogsled rides and much more. Check out the online events calendar or stop in at our office to pick up a copy of the events magazine. Northern Minnesota is one of the best places outside of Alaska to experience authentic dog sledding. Venture back in time when winter transportation was dogs and a wooden sled. Of the numerous kennels in the area, some are competitive racers. See the photo of Colleen Wallin and her dog team from Silver Creek Sled Dogs (phone: 218-834-6592) competing in the historic John Beargrease Sled Dog Marathon. Several of the mushers provide guided tours, even adding ice fishing and winter camping to the fun. Follow the link below for a list of local mushers. Hup hup! Riding in a horse drawn sleigh through the winter woods is a classic image in everyone`s mind. Experience it for yourself on the North Shore. During most winters there will be two choices for amazing sleigh rides. The local tourism association runs rides in the Lutsen-Tofte area, call 888-61NORTH for more information. If you are heading up the Gunflint Trail, Okontoe Lodge has a history of running sleigh rides. www.okontoe.com. Waters Meet Spa and Wellnss Center We value your special time with us, for rest, reflection and renewal. Massage services are provided by members of an association of experienced wellness professionals who work cooperatively at either of the two north shore locations. The scenic drive to Grand Marais is a picturesque drive up the North Shore. Experience this quaint harbor village and the wonders of art, culture, dining, shopping, and of course the harbor itself. View the lighthouse and a closer look at moored sailboats. Enjoy a coffee at an eco friendly cafe and then shop the amazing art galleries and studios. Well known for its festivals and events, follow the link below for more information on the Arts Festival, Dragon Boat Festival and Fisherman`s Picnic. Located within walking distance of Grand Marais` Lake Superior Harbor, the Cook County Community Center offers open ice skating at an outdoor rink. Didn`t bring your ice skates? Rentals may be available. Follow the link below to view a Winter Brochure. This will include scheduled warming house with attendant hours. Open skating is available when other events are not scheduled and regardless of warming house and attendant hours. For the most part, ice fishing on inland lakes in Northern Minnesota is remote. Fishing is out in the open with no heated fish houses and holes are drilled by hand. Lake trout and walleye are what is commonly caught. Walleye season on border lakes runs through April 14th so follow the link below to book your guided day trip. There are opportunities of easy access to four spectacular, year-round state parks near Cascade Vacation Rentals. They are Tettegouche, Temperance River, Cascade River and George Crosby Manitou. Lake Superior is next door to these picturesque parks and their features include waterfalls, rivers, and pristine forests. Adventures range from season to season including hiking, biking, fishing, cross-country skiing, snowshoeing and wildlife viewing. Along the way stop at the historic Split Rock Lighthouse State Park and Gooseberry Falls State Park. The Gunflint Trail offers a wild, quiet country allowing a step back from the hustle and bustle of the every day world. Enjoy the untamed wilderness, take in the wildflowers, forest and lakes as you drive along the Gunflint Trail National Scenic Byway. Experience fishing, cross-country skiing, and wild berry picking.